I am a classical guitar teacher at the Royal Welsh College of Music and also musical director of the National Youth Guitar Ensemble in Wales. I am primarily a professional guitarist, giving solo recitals around the UK and abroad. My full biography is below! Irish guitarist Manus was born in London in 1988 and began studying the guitar at the age of seven. At 16 he was taught privately by Craig Ogden for two years before continuing his studies with Gary Ryan at the Royal College of Music in 2006. In 2010 he graduated with first class honours and was awarded a scholarship to do his Masters in Performance at the Royal Academy of Music. Manus gave his debut performance at the Cadogan Hall, London at the age of 19. He was also given Performance Awards by the Musicians Benevolent Fund, Countess of Munster and Ian Flemming Trust, and was accepted onto the Park Lane Group Young Artist’s Concert Series at the Purcell Room, London Southbank Centre. He won first prize in the Ivor Mairants Guitar Competition in 2011. 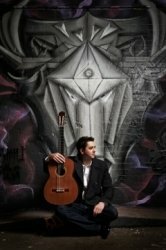 After graduating from the Royal Academy of Music with Distinction, has launched his career in the UK with great success, giving recitals and masterclasses at festivals such as West Dean, Cheltenham Guitar Festival, Bath International Guitar Festival, Beechwood Guitar Course and London International Guitar Festival. He has been accepted onto the Countess of Munster for two years running, as well as the Making Music recital scheme in 2014, and is now in high demand as a performer. Recent performances include solo recitals at Kings Place (London), Sage Gateshead (Newcastle) and Bridgewater Hall (Manchester). He was also awarded first prize for the Guitar Competition at the Royal College of Music before going on to the String Player of the Year Competition. is now the Musical Director of the National Youth Guitar Ensemble in Wales, and teaches at the Royal Welsh College of Music and Drama. As well as writing new works for the instrument himself, has developed a certain flair and passion for modern techniques and repertoire, with many composers choosing to write new works for him, including ‘Hot Club Francais’ by Gary Ryan. Manus uses Concerto Carbon Cases, and his guitars are made by the English luthier, Stephen Hill. I have taught guitar for over 10 years, at both a beginner level all the way up to professionals and Conseravatoire students. I teach all ages and ability levels. I very much structure my teaching around the student's individual needs. I always have my guitar with me to demonstrate ideas clearly and also (hopefully) give the students a sound that they should be working towards. I don't like the traditional, cold and somewhat dry style of some classical music teachers, so always have a friendly and humorous approach to things.